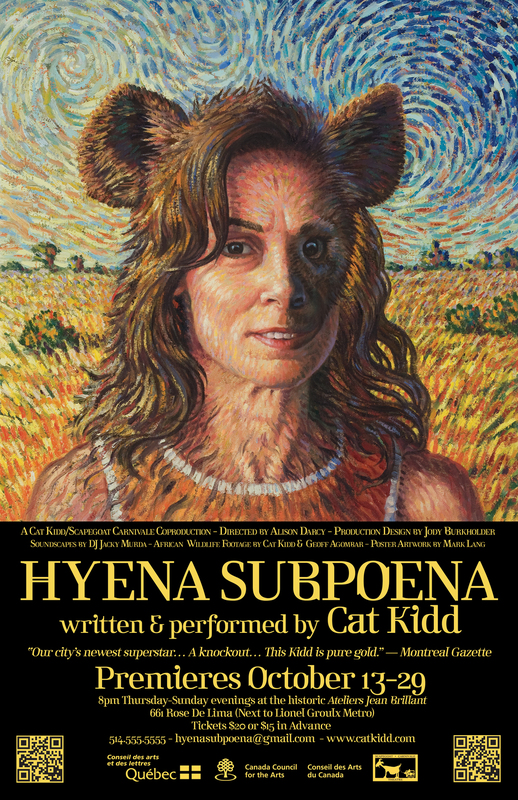 ‘Hyena Subpoena – seven poems with soundscapes’ is the newest release from poet/performer Catherine Kidd with longtime musical collaborator Jacky Murda (aka dj Jack Beetz), published by Wired on Words. Lion Queen at New City Gas is up on Youtube now. Thank you to everyone who came to the show Saturday night! It meant so much to us to see so many friends old and new. Video of Lion Queen [Ode to a dying lioness] at New City Gas is up on Youtube now. Lion Queen [Ode to a dying lioness], one of 6 story-poems performed Nov. 27 2010 at New City Gas. Video shot by Catherine Kidd & Geoff Agombar in Kruger National Park during a South African tour of Kidd’s solo show ‘Sea Peach’. Being-Hit-On-The-Head Lessons, Hyena Subpoena, Sea Peach, The Lottery, and Dream of Friends. (Montreal) This November 27th an enchanting experience awaits audiences as two Montreal originals combine for one special evening of performance poetry in situ. Beneath the rafters of New City Gas’s Dalhousie Hall, Catherine Kidd will preview works from her upcoming solo show Hyena Subpoena (to be launched in 2011) alongside road-tested favourites from previous works Sea Peach and Bipolar Bear. The pieces will feature original soundscapes by DJ Jacky Murda (Barcelona) and video environments by Kidd and Geoff Agombar. This performance marks a return to source for Catherine, following an extended absence from Montreal stages to work on the Hyena Subpoena manuscript – a series of stories that interweave personal traumas in the life of narrator Ramona Morse with experiences and wildlife footage collected by Kidd and Agombar during a 2007 tour of South Africa. Built in 1859-61, New City Gas was a key player during the industrialization of Montreal, producing and distributing gas which lit the city’s streets, homes and factories. The buildings’ stone masonry, vaulted spaces and stout, open rafters stand in testament to the ambitions of a bygone era of social upheaval and energy revolution. Today this industrial heritage lives on as the complex still houses a paper warehouse, even as various sections are converted to fresh uses as galleries and ad hoc performance spaces. • More information available at heritagemontreal.org/en/new-city-gas or griffintown.org/corridorculturel/nuitblanche. An incontournable of Montreal’s spoken word scene since the early ’90s, Catherine Kidd has forged a reputation as one of the nation’s most surprising and inspiring voices for page and stage. Her award-winning multimedia poetic creations have toured Europe, Asia, Africa, UK, US and Canada. SEA PEACH: Recorded 2002, during the original staging of the multimedia stageshow of the same name. Performed in the deep end of an abandoned Montreal swimming pool, with video projection on the tiled wall, and original soundscapes mixed live on turntables by DJ Jack Beets. Description: This sea creature looks remarkably like a human heart. In finding a peacable balance between giving and taking, it becomes a powerful emblem of love. HUMAN FISH: This story asks how a Slovenian salamander who is white, blind and lives in a cave came to be known as a ‘human fish’.